This is a nice soup for those desiring a vegetarian meal for a cool day’s lunch or dinner. The ingredients can be varied which I feel always adds interest to your dish. It’s also a complete protein meal so you don’t have to worry about having poultry, meat or fish as well. Bon Appétit. 1 Lb. Chard, stems removed (I used the rainbow variety) You could also use spinach or Kale or a combination of the greens. Cook your greens any which way you wish; drain thoroughly and set aside. In a large stove top Dutch oven or similar kind of pot, heat the oil over medium heat and add the potatoes, onions and garlic cloves. Sauté for 5-10 minutes—watching carefully and stirring quite often—until the potatoes have started to brown. Add to this the paprika, turmeric, salt and cayenne until the mixture smells fragrant (around 1-2 minutes). Add the bouillon, greens and chickpeas and bring to a simmer. Simmer with a tipped top for about 15 to 20 minutes—or till the potatoes are tender. 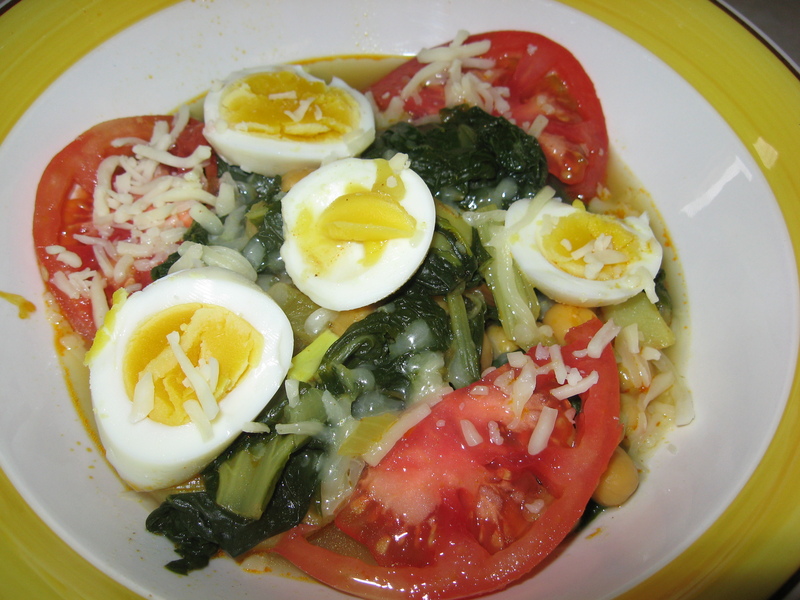 Serve the stew topped with the hard boiled eggs, tomato slices, cheese and chopped parsley.